Drive around rural Cumberland, Gloucester and Salem counties, and you'll be struck with the number of small yet vibrant churches you'll pass on the road. One I saw on a recent visit actually had "garden angels" in its front yard: scarecrows of a sort that were dressed in pretty, almost angelic garb. If you drive slowly enough down one particular two-lane road in Deerfield Township, you'll see another small house of worship. 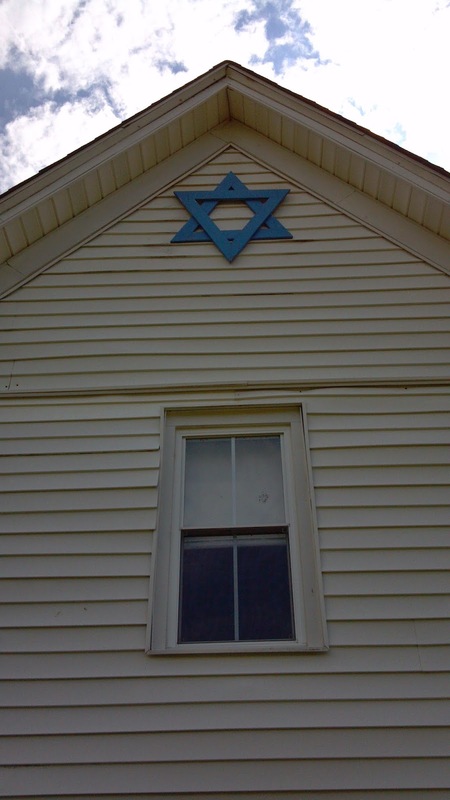 This tiny white box of a sanctuary is different from the others: instead of a cross, its simple facade is adorned with a blue Mogen David, or Star of David. Its official name is Beth Israel, but it's better known as the Garton Road Shul. Unlike many similar colonies in other parts of the United States, the South Jersey Jewish farming collectives met with a degree of success. Decent soil and rail access to Philadelphia and New York meant the farmers could easily get their products to market while attracting funding and visits from benefactors from the cities. Urban "pleasurenikers" flocked to the farms during the summer to escape city heat, boarding at the farms and bringing additional income to the settlers. The names of these once-flourishing colonies still dot maps of the region today - Alliance, Brotmanville, Norma, Zion, Mizpah, Rosenhayn - though the villages themselves have become more secular in nature, if they still exist at all. I drove through Norma to find it's pretty much a cluster of homes and a post office, and I suspect that I passed through Brotmanville and Rosenhayn though I didn't notice any real signs of towns. If the communities are hard to locate and generally mentioned in history books as a collective group, Garton Road is both the easiest and most difficult to find. The road itself is shown on maps, but there's very little written about the colony that shared its name. Fortunately, the Cumberland County Cultural and Heritage Commission has posted a small sign at the location, with a link to more information. Between that and a few other sources, the story started to come together. What I discovered was this: a handful of immigrant Jewish men settled on 20 acres along the road in 1888, naming their community Garton Road for local lumber merchant Henry Garton. After clearing sites for small houses and a farm, the men sent for their families, and together the community learned how to grow vegetables like corn, strawberries and beans. One of the defining characteristics of the group was their devotion to agriculture, continuing to work the farm when many in the neighboring communities turned to other ways of making a living. Religion, of course, was an important factor of life at Garton Road, and the devout Orthodox residents walked to the Rosenhayn synagogue to attend sabbath and holiday services. The arrangement lasted only a few years; older members found the three mile trek taxing, leading the group to form its own congregation in 1890. 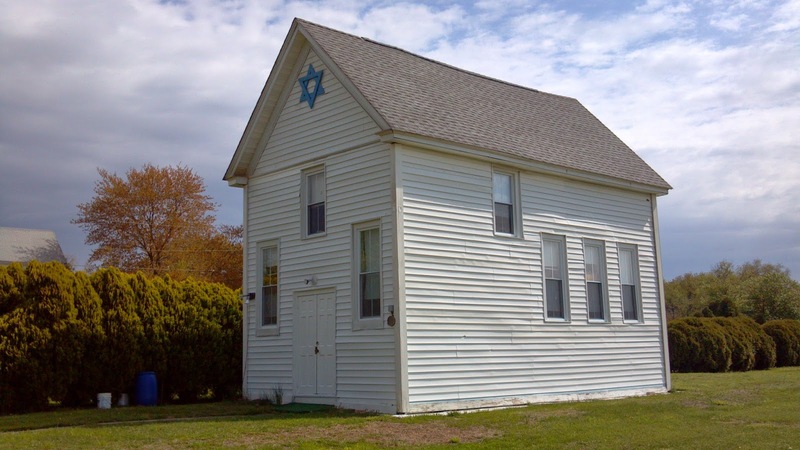 According to the Jewish Federation of Cumberland, Gloucester and Salem Counties, Garton Road's Beth Israel congregation met in a member's home as they saved funds to build a shul of their own. The owner of New York's Yiddish Theatre loaned them the rest of the necessary money and the building was erected. Still, though, the congregation had no rabbi of its own, counting on the wisdom of some of its more learned members for guidance. When I stopped by to see the shul, I was awed by the fact that an entire community of devout worshipers could make do with such a small synagogue. It's hard to believe there's a balcony in there, where women attended services hidden from view by a curtain, per the Orthodox tradition. As many as 20 children at a time crowded into the building's entryway for religious instruction, and attendance swelled when the pleasurenikers stayed for the summer. Somehow, more than 150 congregants were able to worship in the structure each Sabbath. The small building has seen highs and lows along with the community it serves, with farm foreclosures and the Great Depression reducing the population in the 30s and the influx of German Jews fleeing for the safety of New Jersey enlarging the group during World War II. By the 1970's, however, the early congregants had died and their children had moved away to build lives in more developed areas. Better road systems and transportation made it easier for those who remained to attend services in larger temples in Bridgeton and elsewhere. The little shul opened only during the High Holidays. Today, the Garton Road Shul is cared for by members of the Ostroff family, descendants of a family that came to the community from Russia in 1898. While I was only able to see the outside of the building when I visited, I can safely say they're doing a wonderful job. The white doors and clapboard walls look fresh, clean and unweathered, as if they were recently painted, and I could easily imagine that congregants had been there just hours before for Shabbat services. Surely, if the community's founders could see it, they'd be kvelling. You should contact the Ostroff family and arrange to return to tour the interior. Also, there are other synagogues in the area still standing. The first building of Bridgeton's Congregation Beth Abraham is now a church (111 N Laurel Street), but you can still see a Star Of David in the bricks above the entrance. Woodbine's Brotherhood Synagogue (612 Washington Avenue) is now a museum. The Brotmanville Shul (1176 Gershal Ave) is now a church. Carmel's Temple Beth Hillel (547 Irving Ave) is an active synagogue (merged with Bridgeton's Beth Abraham some years ago). Norma's Tifereth Israel (Gershal Ave & Shiff Ave) is seemingly unused, though looked after. Crown Of Israel Synagogue (somewhere in Monroeville/Elmer) also seems unused. Ahavas Achim in Norma (Almond Rd & Wallace St) might be a house now, but you can still see a Star of David design in the top windows on the sides of the building facing both Wallace Street and Almond Road (further from street).